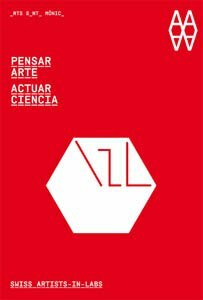 The primary aim of the Swiss Artists-in-Labs program is to encourage communication between art and science. What began as an ad hoc contextual framework resulting from an artistic-scientific residence was transformed into something with a specific weight, into a unique quality, or the creation of a new space where new encounters, connections and concepts can take place. The book Think Art - Act Science showcases contemporary works of art and presents reflections on the discovery processes experienced by a series of artists who have produced lengthy creative dialogues that are the results of immersion in the form of nine-month artist-in-residence programmes in science research laboratories. the artists featured in the book have produced lenghthy creative dialogues and through their work present their reflections on the discovery processes experienced at the residency.